Browse for electric scooter wheels by vehicle make and model. Front plastic electric scooter wheel with solid urethane airless flat-free tire. Includes wheel bearings and bearing spacer. 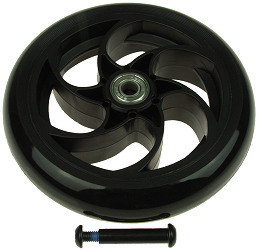 Rear plastic electric scooter wheel with solid urethane airless flat-free tire. Includes wheel bearings, bearing spacer, and 60mm band brake rotor. Fits Pulse® Charger electric scooters plus many other makes and models. 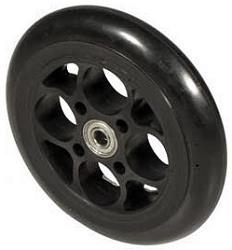 Rear plastic electric scooter wheel with solid urethane airless flat-free tire. Includes chain sprocket, wheel bearings, bearing spacer, and 60mm band brake rotor. Fits Pulse® Lightning electric scooters plus many other makes and models. 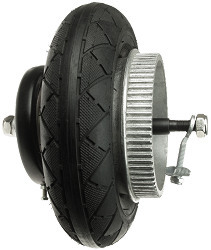 Rear plastic electric scooter wheel with solid flat-free urethane tire for chain drive Razor® E100, E125, E150, & E175 electric scooters. 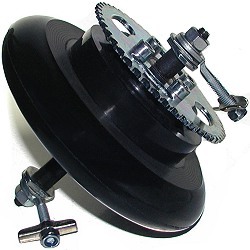 Includes chain sprocket, two wheel bearings, axle, axle adjusters, and mounting hardware. 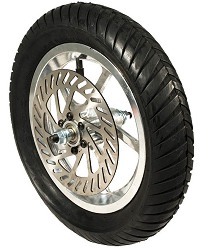 Front aluminum alloy electric scooter rim for 200x50mm (8x2) tires and tubes. Two piece split rim design. Uses two 6200Z or 6200RS wheel bearings. Hub width is 1-7/8". 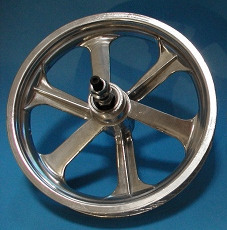 Rear aluminum alloy electric scooter rim for 200x50mm (8x2) tires and tubes. Two piece split rim design. 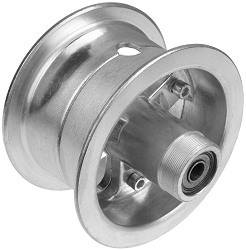 Hub is threaded with M35x1.00 right-hand threads on one side for a band brake. Built-in drive belt cog works with any length of HTD 5M-15 drive belt. Uses two 6200Z or 6200RS wheel bearings. Hub width is 3". 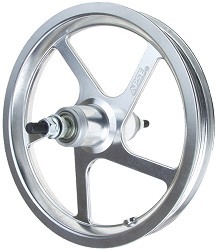 Front wheel replacement for the Razor® E100, E125, E150, E175 and E200 electric scooter. Includes rim, bearings, bearing spacer, and 200x50 (8x2) inner tube and tire. Hub width is 2-5/16". Bearings are size 6000Z which have a 10mm ID (for 10mm axles). 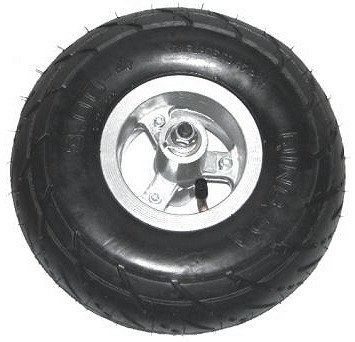 Front electric scooter wheel with 8x2 (200x50) tire and tube. 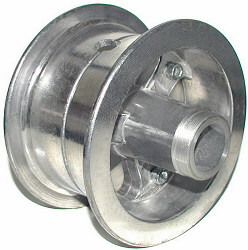 Includes two wheel bearings, bearing spacer, axle, and mounting hardware. Hub width is 2-7/8". Bearings are 6001Z which have a 10mm ID (for 10mm axles). 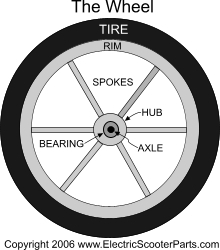 Rear wheel with built-in belt cog, tire, tube, brake, axle, axle spacers, and mounting hardware. Fits belt drive Razor® E200 and E200S electric scooters. Rear wheel with tire, tube, chain sprocket, brake, axle, axle spacers, and mounting hardware. Fits chain drive version 36+ Razor® E200 and E200S electric scooters. Front aluminum alloy electric scooter rim for 9x3.5-4 or 10x3.00-4 tires and tubes. Two piece split rim design. Rim is 2-3/4" wide x 4-7/8" high. Hub is 2-1/2" wide. Uses two 6000Z or 6000RS wheel bearings. Rear aluminum alloy electric scooter rim for 9x3.5-4 or 10x3.00-4 tires and tubes. Two piece split rim design. 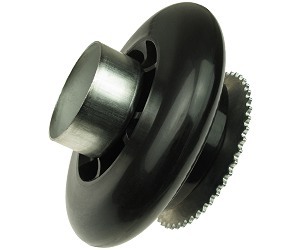 Hub is threaded on both sides with M35x1.00 right-hand threads for chain sprocket or belt cog and band or disc brake. Rim is 2-3/4" wide x 4-7/8" high. 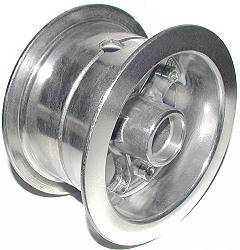 Hub is 5-1/8" wide. Two pre-installed 6000RS wheel bearings. The wheel bearings installed on this rim are for 10mm diameter axles. Rear aluminum alloy electric scooter rim for 9x3.5-4 or 10x3.00-4 tires and tubes. 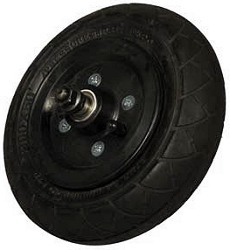 Two piece split rim design for easy tire installation. 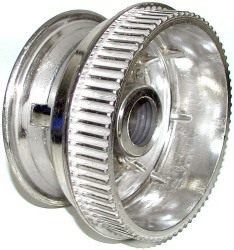 Hub has three threaded hole on one side for a chain sprocket, and is threaded with M35x1.00 right-hand threads on the other side for a band brake. Rim is 2-3/4" wide x 4-7/8" high. Hub is 4-1/4" wide. Two pre-installed wheel bearings - one 6000Z and one 6000RS wheel bearing. The wheel bearings installed on this rim are for 10mm diameter axles. Front steel electric scooter and pocket bike wheel with 2.80/2.50-4 tire and tube, two wheel bearings, axle, safety clips, and mounting hardware. Fits versions 41 and up of the Razor® E300, E300S, and E325 electric scooters. 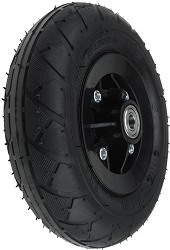 Also fits version 40 and under Razor® E300, E300S, and E325 electric scooters however the 2.80/2.50-4 tire on this wheel is a little smaller than the original 10x3.00-4 tire. 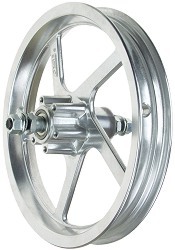 Rear aluminum alloy electric scooter wheel with 10x3.00-4 tire and tube, 90mm band brake, 55 tooth sprocket with freewheel, rim, two wheel bearings, bearing spacers, axle, wheel adjusters, and mounting hardware. Fits version 36 through 40 of the Razor® E300, E300S, and E325 electric scooters. 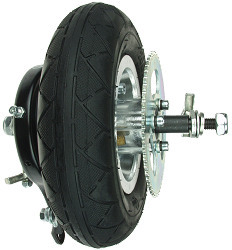 Front wheel assembly with tire, tube, axle, bearing, and mounting hardware for the eZip® E-450 electric scooter. 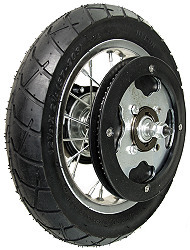 Rear wheel assembly with tire, tube, chain sprocket, axle, bearing, and mounting hardware for the eZip® E-450 electric scooter. Front aluminum alloy electric scooter rim for 12-1/2x2-1/4, 12-1/2x2-1/2, 12-1/2x2-3/4, and 12-1/2x3.00 tires. Hub does not have threads for a brake. Uses two 6001Z or 6001RS wheel bearings. 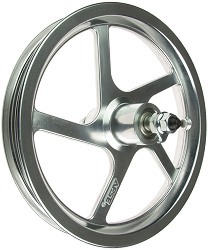 Replacement front wheel for Boreem, Bravo, Dolphin, Freedom, E-Scooter, Target® Road Racer, ScooBug, Spirit, Star II 029, Sunl, Terminator, Viper, X-Treme X360, plus many others. Rear aluminum alloy electric scooter rim for 12-1/2x2-1/4, 12-1/2x2-1/2, 12-1/2x2-3/4, and 12-1/2x3.00 tires. Hub has M35x1.00 right-hand threads on both sides to install a chain sprocket, belt cog, or freewheel on one side, and a brake on the other side. Uses two 6001Z or 6001RS wheel bearings. 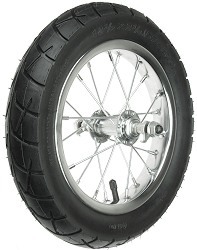 Replacement rear rim for Boreem, Bravo, Dolphin, Freedom, E-Scooter, Target® Road Racer, ScooBug, Spirit, Star II 029, Sunl, Terminator, Viper, X-Treme X360, plus many others. Front aluminum alloy electric scooter rim for 12-1/2x2-1/4, 12-1/2x2-1/2, 12-1/2x2-3/4, and 12-1/2x3.00 tires and tubes. For scooters with no front brakes or front V-brakes. Includes rim, two 6000Z bearings, axle, and mounting hardware. Hub width measures 2-3/4" across. Fits front forks with 3-7/8" inside spacing between mounting dropouts. APSE brand. Designed for Currie® electric scooters. 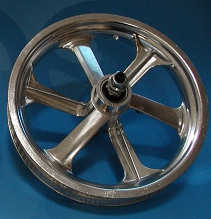 Replacement front rim for Currie®, eZip®, IZIP®, Schwinn®, Mongoose®, and GT® electric scooters. Front aluminum alloy electric scooter rim for 12-1/2x2-1/4, 12-1/2x2-1/2, and 12-1/2x2-3/4, and 12-1/2x3.00 tires and tubes. Hub has six threaded holes for mounting a disc brake rotor on one side. Designed for scooters with front disc brakes. Includes rim, two installed 6000Z bearings, axle, and mounting hardware. Hub width measures 2-3/4" across. Fits front forks with 3-7/8" inside spacing between mounting dropouts. APSE brand. Designed for Currie® electric scooters. Rear aluminum alloy electric scooter rim for 12-1/2x2-1/4, 12-1/2x2-1/2, and 12-1/2x2-3/4, and 12-1/2x3.00 tires and tubes. Hub has 1.375 x 24 TPI right-hand threads for mounting a chain sprocket on one side and six threaded holes for mounting a disc brake rotor on the other side. Includes two installed 6000Z bearings, axle, and mounting hardware. APSE brand. Designed for Currie® electric scooters. 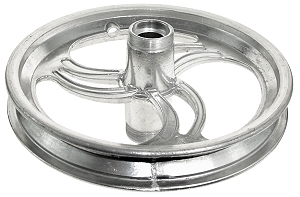 Replacement rear rim with single treaded hub for Currie®, Schwinn®, Mongoose®, and GT® electric scooters. Rear aluminum alloy electric scooter rim for 12-1/2x2-1/4, 12-1/2x2-1/2, and 12-1/2x2-3/4, and 12-1/2x3.00 tires and tubes. Hub has 1.375 x 24 TPI right-hand threads for mounting a chain sprocket on one side and a brake on the other side. Includes two installed 6000Z bearings, axle, and mounting hardware. APSE brand. Designed for Currie® electric scooters. 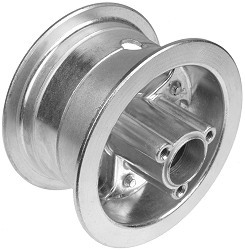 Replacement rear rim with dual threaded hubs for Currie®, Schwinn®, Mongoose®, and GT® electric scooters. Front aluminum alloy electric scooter rim for 12-1/2x2-1/4 12-1/2x2-1/2, 12-1/2x2-3/4, and 12-1/2x3.00 tires and tubes. 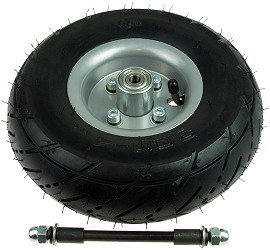 Includes sealed wheel bearings, axle, and mounting hardware. Replacement front rim for pre-2005 Currie, GT, Mongoose, and Schwinn electric scooters plus all Powercats Tiger electric scooters. Rear aluminum alloy electric scooter rim for 12-1/2x2-1/4, 12-1/2x2-1/2, 12-1/2x2-3/4, and 12-1/2x3.00 tires and tubes. Dual threaded hub has 1.375 x 24 TPI right-hand threads for mounting a chain sprocket on one side and a brake on the other side. 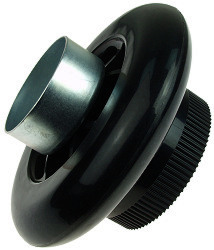 Includes sealed wheel bearings and axle with mounting hardware. 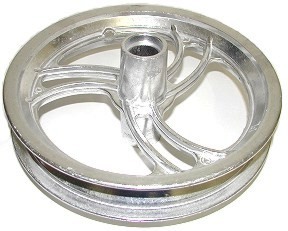 Replacement rear rim for pre-2005 Currie, GT, Mongoose, and Schwinn electric scooters plus all Powercats Tiger electric scooters. Front wire spoke electric scooter wheel with 12-1/2x2-1/2 tire and tube, axle, axle spacers, and mounting hardware. 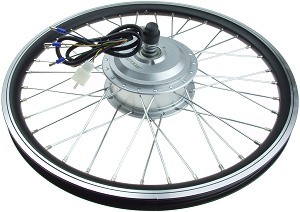 This wheel has a thick steel rim and heavy-duty steel spokes to handle the extra weight of the battery pack and rider. Replacement rear wheel for Razor® Pocket Mod electric scooter version 13 and up. 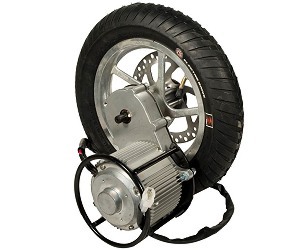 Rear wire spoke electric scooter wheel with 12-1/2x2-1/2 tire and tube. 80 tooth chain sprocket with freewheel, band brake, axle, axle spacers, and mounting hardware. 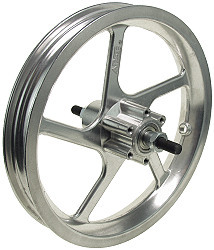 This wheel has a thick steel rim and heavy-duty steel spokes to handle the extra weight of the battery pack and rider. Replacement rear wheel for Razor® Pocket Mod electric scooter version 13-30. Replacement rear wheel for Razor® Pocket Mod electric scooter version 31 and up. Front aluminum alloy electric scooter wheel with 12-1/2x3.00 tire and tube, 160mm disc brake rotor, two wheel bearings, axle, and mounting hardware. APSE brand. 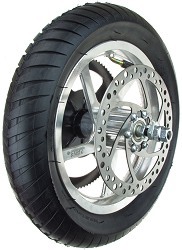 Replacement front wheel for eZip® and IZIP® 900 and 1000 electric scooter. Rear aluminum alloy electric scooter wheel with 12-1/2x3.00 tire and tube. Includes 90 tooth sprocket for #25 chain, axle with spacers, axle nuts and washers, two wheel bearings, and band brake. Rear aluminum alloy electric scooter wheel with 12-1/2x3.00 tire and tube. 90 tooth sprocket for #25 chain, 160mm disc brake rotor, axle with bearings and mounting hardware. 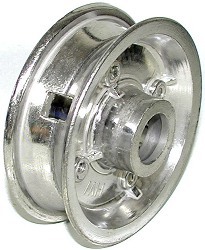 Replacement rear wheel for eZip® and IZIP® electric scooters. Rear aluminum alloy electric scooter wheel with attached 36 Volt 1000 Watt brushed rare-earth magnet electric motor and fully enclosed gear-reduction transmission system. Includes 12-1/2x3.00 tire and tube, disc brake rotor, two wheel bearings, and axle. Designed for the eZip® and IZIP® 1000 electric scooter. 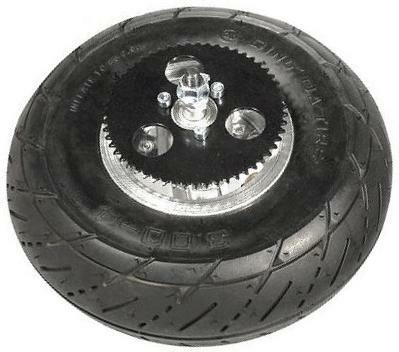 Replacement rear wheel for eZip® and IZIP® 1000 electric scooter. Front wheel for Zumaround Zum electric scooter. 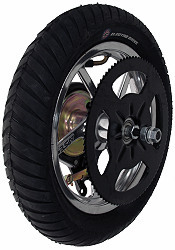 Wheel works with 20" tires and has a 36 Volt 250 Watt brushless electric hub motor.